Arthur continues to be very pleased with his new boxes, this one is ideal for washing in. Personally I would have thought it’s a bit like trying to get dressed in a tent, but apparently it’s just the right size. 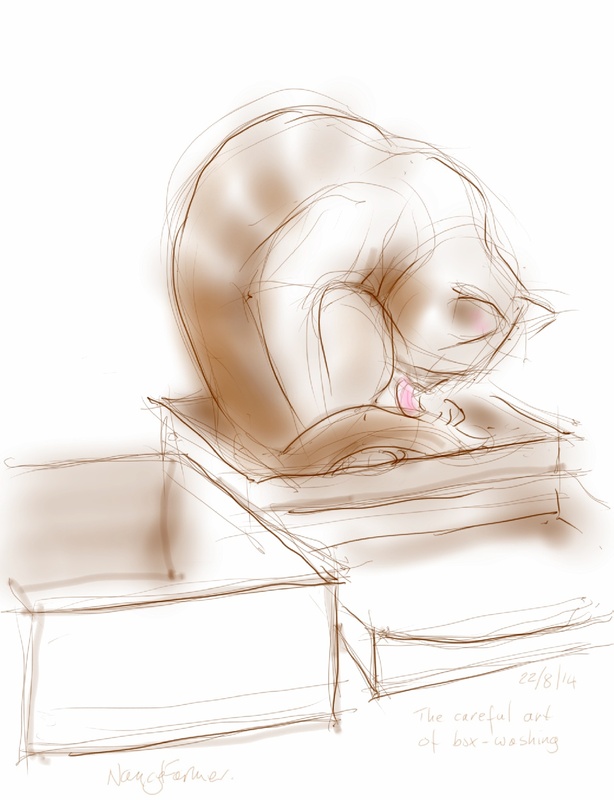 This entry was posted in Cats and tagged art, arthur cat, cat drawing, cat washing, cat-of-the-day, digital sketch, drawing, ginger, life drawing, phone sketch on August 22, 2014 by Nancy Farmer. Hi Tim, thanks again. No, they are actually digital, sketched on my oversized phone – a Galaxy Note 3 – which comes with a little stylus. Not the sort of stylus that people use with ipads, it has a pointy end an is quite like using a pencil, except much quicker because of the availability of colours and so on.